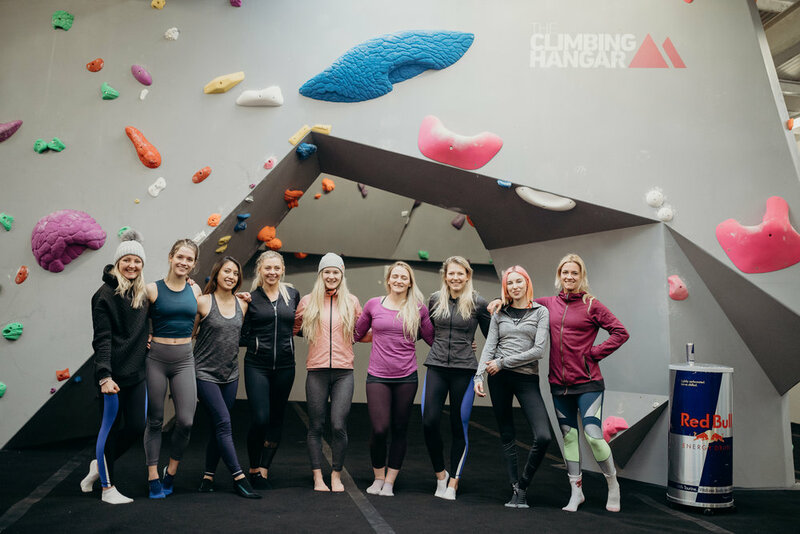 ‘The Beast From The East’ has done it’s best to thwart our travels, but a group of fellow sport and fitness journalists and bloggers have triumphed, huddling together in the freshly constructed Plymouth Climbing Hangar in the Western tips of the UK. 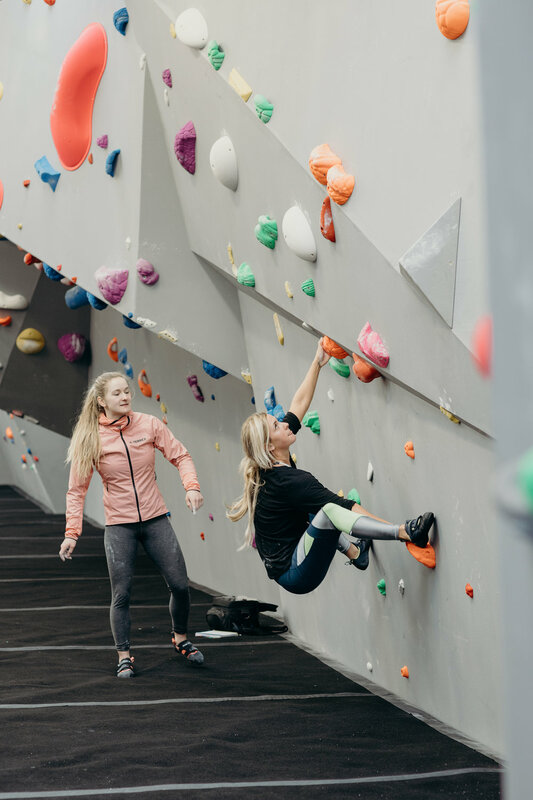 We’ve battled the ‘Beast’ to reach the all-new climbing facility for an exclusive Redbull training session with climbing sensation, World Champion Shauna Coxsey and training partner and fellow climber Leah Crane. 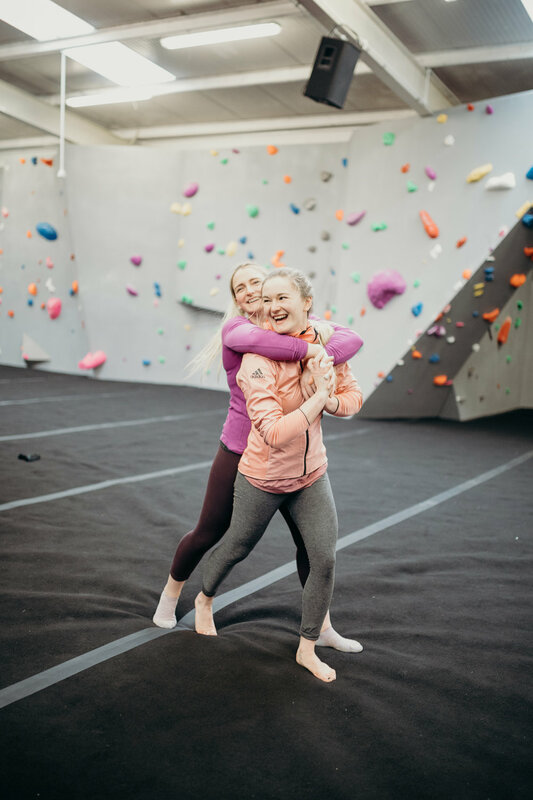 Climbing has been a constant in the tenacious athlete’s life, grappling with her first boulders at the tender age of 4 having been wowed by climbing on the TV and falling “in love with it instantly… (I) decided that’s what I wanted to do”. 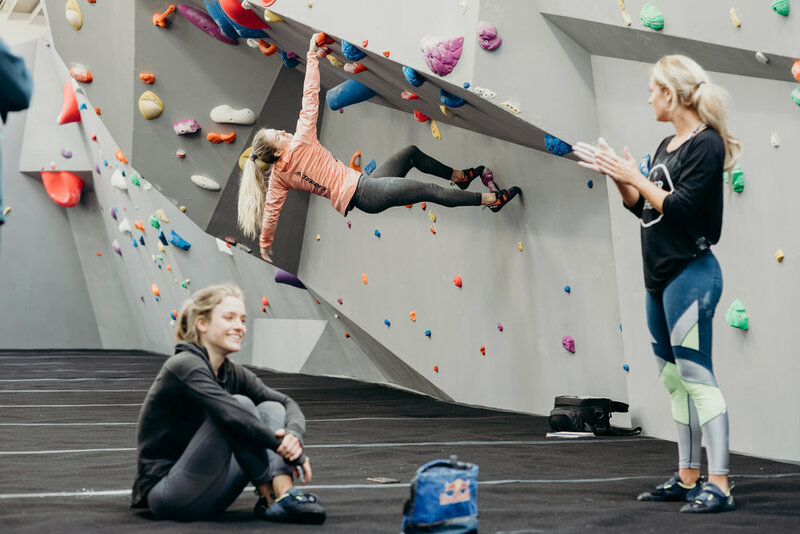 Honing her internationally lauded skills at kid’s clubs in the UK and by asking her dad if she could “learn some belay”, Shauna was competing by the age of 7. The first phase of her climbing career was based predominantly indoors, but gradually progressing to outdoor. 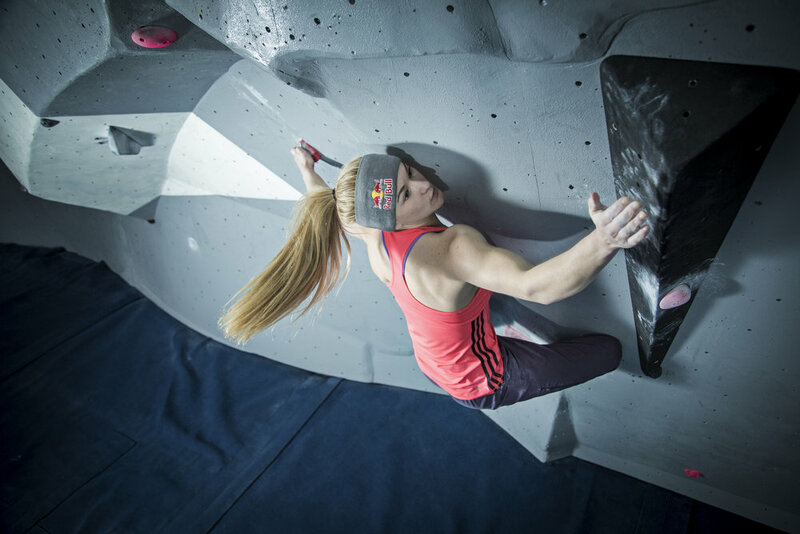 For now, the World Champion’s focus is on “competition climbing…so indoor is my focus”. “Experience is one of the things you can’t value enough, … the more you get out there and do the things you want to be better at, the better you’re going to be. So if you do get nervous and you don’t want to, putting yourself in those environments and learning new skills is a good way to try and improve”. Watching Leah and Shauna together it’s clear how much joy that take from training and climbing, and together they admit that they try and make every training session they have as fun as possible, often to the bemusement of other climbers who watch their methods which include “yogabatics” (acro yoga), ball games for focus and agility, and generally trying to have a blast (the girls admit many spectators often ask for tips afterwards, seeing how much fun the girls have.) An incredibly positive disposition and approach to her sport is palpable in Shauna, and infectious – many of us, under her guidance and encouragement are attempting holds we haven’t before and with stoked-out success. When surfing and skateboarding were contentiously added to the Olympics there was a divisive split between those purists who argue it is against the heritage and freedom based DNA of the sports, and those who see it as positive progression and an opportunity to see their sport showcased on a global platform, climbing too caused similar divides. “In my opinion" Shauna begins, "I think the more exposure a sport can get the better. The Olympics is the most prestigious sporting event in the world. If our sport can be showcased in a positive way then that can’t be a bad thing. If more people are getting involved in the sport, finding a new passion, finding a way to lead a healthier, active lifestyle, that surely can only be a good thing. I can see why people would be apprehensive about it but I think it’s really a good thing in that the more people will see climbing will go and try it. If one person finds a passion, just a small percentage of what I have in climbing, then that’s incredible”. It is clear Shauna has a relentless passion for her sport and for anyone else finding as much joy in it that she has, something that led her to create the Women’s Climbing Symposium 8 years ago, and which ultimately she was awarded her MBE for by the Queen for services to her sport. An all-female led event, Shauna explains that “Initially it was an event about barriers and tackling them. I didn't realise when I started climbing that there were women who were afraid to climb with their boyfriends, or get big muscles, or climb when they were on their period, or there would be things that I never would have considered…I wanted to open up a dialogue and give an opportunity to ask questions, talk and learn from it and other people’s experiences." The future looks incredibly exciting for the Champ, and as we dust off our chalky hands and share high fives with Shauna and Leah, it isn't hard to imagine seeing Shauna on the Olympic stage with the same energy, an emboldening mix of positive vibes and super-hero strength and talent.